to think or worry abut your car until we build the next one. Click to download a look at our service options and rates. best spent. At the end of the day, our goal is to take care of your issue, the way you want it done. Should you find a workmanship issue in the life of the installation, KELTEK will send someone to your location, within 24 hours, to fix the issue at no cost to you. NOTE: The below items only cover new product sold by KELTEK. Reused or customer provided product is not covered. - At KELTEK: No service rates will be assessed for replacement and scheduled re-installation. - At your location: Standard service rates apply (see service rate tab). - At KELTEK: Standard service rates apply (see service rate tab). Charges billed by manufacturer for the repair will be assessed upon repair completion. - At your location: Standard service rates apply (see service rate tab), mileage and any charges billed by manufacturer for the repair upon completion. * If the product is out of warranty but able to be repaired by vendor, you will have the choice of repairing the product and keeping as a spare ( the repaired product will be shipped to you ) or discarding product. If service request falls outside of our normal hours (M-F 8-5), you will be charged $399 for the initial service all which included the first hour of service. See above for 'Prolonged Service Rates' for additional rates. Note: Travel charges not included. The mileage rates below are based on one way from our headquarters in Baxter to your location. Let’s be honest, Baxter is off the beaten path. We know it is not an “ideal” location for some of our customers, however, being centrally located, we can be anywhere within three hours. It is also the birthplace of our founder and we take pride in taking care of our community. Why not open more locations? We have had many requests to have alternate locations opened, around the state, with the opportunity to better service our customer. If the answer to any of these questions is no, we don’t move forward. Although the thought of a new facility or multiple locations is enticing, we feel this would ultimately have a negative effect on our customers. With new facilities comes more cost with the facility itself, cost of hiring additional employees, additional training and potential for a variation in the quality service we provide. What this translates to is higher cost for all services (installation, upgrades, deployments, etc.). As we all know, the industry changes drastically in short order, with new product and technology continually being released. KELTEK has always been committed to providing the “expert” technicians and installers in the public safety space. That investment carries a cost. We continually strive to be fair with all labor and services pricing and would not want to put an undue burden on our customers to pay for something we don’t feel would give benefit for the higher prices. 1.) Complete the Service Request Form to the right. 2.) 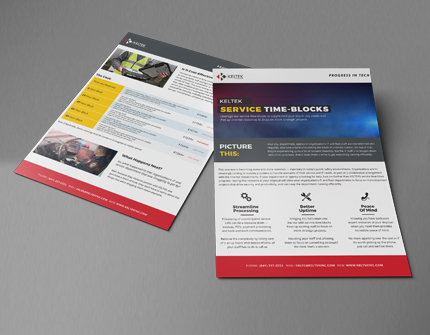 Click submit and a KELTEK service representative will confirm your service request within 4 hours. Ask to speak with a service technician.